The Start-up of You explicitly states it is not a job-hunting manual that will advise you on formatting your résumé or preparing for a job interview. Instead, it recommends strategies to expand your network, gain a competitive edge, and land better professional opportunities. The main message of the book is that everyone has to think of their career as if they were running a start-up. Rather than wait until you are unemployed or unhappy at work, the authors advise you to always be generating opportunities, to continually invest effort in building a network that you can leverage for maximum advantage. Instead of focusing on three and five-year goals, they encourage a mindset described in the tech world as “permanent beta.” Keeping your career in permanent beta means acknowledging that you have bugs, that there is new development to do on yourself, and that you have to adapt and evolve. The authors denigrate the value of self-reflection a bit but then they back off from this when they acknowledge the importance of knowing your values. The authors are more enthusiastic about action because they come from a start-up world where nothing happens without repeated action and flexibility. They recommend that you start down a path and then pivot when new information and changing circumstances change the initial situation. 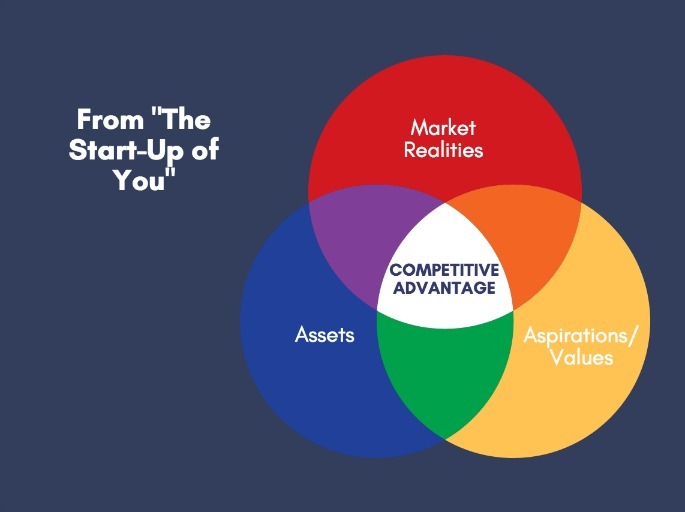 In a competitive marketplace, competitive advantage is formed by the interplay between assets, aspirations/values, and market realities. Soft assets are knowledge, information, professional connections, skills, your reputation, and strengths. Hard assets are cash, stocks, and physical possessions. Aspirations/values are what motivate you. The authors underestimate a bit how much of this is hardwired. In my experience, there are some aspects of aptitude, personality, and values that are mostly fixed and understanding this about oneself leads to better decisions. Market realities include variables like demand for your products and services, geographic differences, degree of competition, etc. I like the point the author make that sometimes changing physical location is the single best thing you can do to improve your career, like when basketball players who aren’t able to land spots in the NBA move to Europe to play there. – Create a professional identity independent from your employer. – “Self-help” is misnamed and the “lone hero” story is a myth. In every career, relationships matter. Across industries, very little gets done by solo efforts. People are the source of key resources, opportunities, information, etc. – Relationship building needs to be genuine and reciprocal. Relationships won’t last long if they are exploitative one-way transactions. – Older sociological research from the 1970s said that the majority of jobs are landed through “weak ties” (people you see occasionally or rarely). It is unclear how online networking has changed this dynamic, but in my experience, acquaintances remain one of the top sources of introductions to jobs. (This is an interesting 2008 article exploring the power of weak ties in a job search. – The book recommends LinkedIn Signal as a way to follow the news in your industry. Signal was phased out in 2003. I like Feedly as a news aggregator. – Introverts are not going to love this book. The book has a definite bias toward coffee dates and face-to-face meetings. I agree these are high yield activities but introverts need to pace themselves to avoid emotional exhaustion. – Don’t beat yourself up if you learn that you have been neglecting career development. Most people don’t do the strategies recommended in this book, which is why you are so much more competitive if you do. – It takes a minimum level of emotional intelligence and communication skills to network well. If you are networking badly, networking won’t yield good results. Emotional intelligence can be improved, so if you find that your professional relationships aren’t proving helpful to you, that should be your focus rather than continuing to do more of the same. Did you find this post helpful? If so, please share it.